When scouting a player you always want to recognize the process over the production. Sure, a player may score a bunch of touchdowns or finish with good sack totals, but how they made those plays matters more than the fact they made them. Sometimes, you get the best of both worlds in a player: someone who is both productive in college, and shows traits and skills which will translate to the NFL. 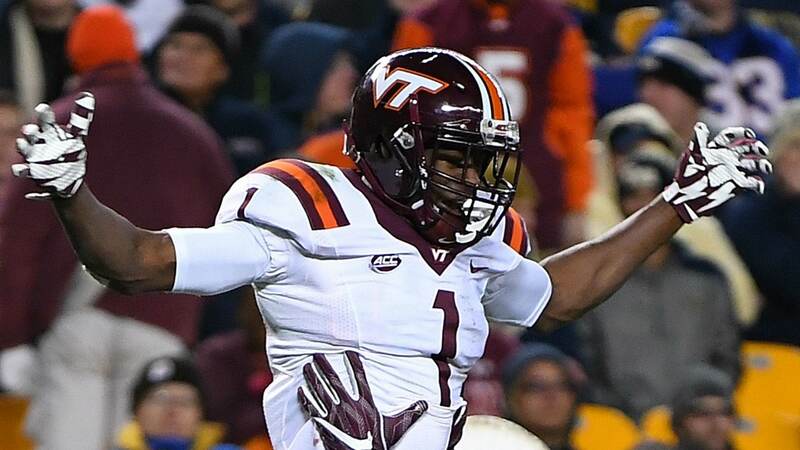 Virginia Tech wide receiver Isaiah Ford is that type of player. Finishing the 2016 season with 75 catches for 1,164 yards and 10 touchdowns, Ford made his impact felt week in and week out at the college level. What makes him an impressive prospect, and someone I would consider drafting towards the end of Day one, however, is how he racked up all of those stats. The first thing I noticed when watching Ford is how well he releases off the line of scrimmage, specifically against press coverage. Here we see the Tennessee cornerback playing right up on Ford pre-snap. He allows Ford a free release, and Ford makes him pay. Ford’s first step and shake make the corner uncomfortable and unsure of what to do. First driving up field and forcing the corner to move his feet, Ford then shakes and quickly breaks inside without losing a step. The corner has no chance to guard this route, unless he somehow guessed right and got lucky. Once again we see how Ford wins off the line so well. He hesitates before breaking outside, freezing the defender and making him unsure of the next move. Once he breaks to the outside, Ford is able to separate from the coverage with ease. He then has the awareness to locate the ball, and the hands to make the over-the-shoulder catch. Ford also has good body control, and is able to keep his feet in-bounds while falling towards the sideline. He tends to do a good job of keeping his balance, and tapping both feet down before falling out of bounds, as we will see later on. As a pure route runner, Ford is very impressive. While he is my fourth highest graded wide receiver so far, I would argue he is a better route runner, and better at gaining separation than Clemson’s Mike Williams. Ford’s hesitation and stutter moves really impressed me the most. His ability to stop on a dime and force the corner to break up-field, before flying by him can be seen clearly in the play above. Ford’s route running and footwork are top-tier, but without good hands and the awareness to locate the ball they would be all-for-naught. Ford is able to high point the ball so well, something that any big time receiver needs to do in the NFL. When you combine his ability to make these plays with his ability to separate and win off the line of scrimmage, you get a serious deep ball threat at the next level in Ford. While it is not pictured here, Ford is very impressive once the ball is in his hands. He is able to get yards after the catch, and make defenders miss in space. He even took a quick screen pass for a touchdown against Tulsa back in 2015. Isaiah Ford is a complete receiver, and is currently WR4 on my draft board. I have a high second round grade on him, but would not be opposed to Ford going in round one somewhere between picks 20 and 32. The consensus among most draft pundits is that Ford is a high-end Day two player, but throughout the remainder of the draft process I expect Ford to rise and have a chance to be selected on Day one.